Saving energy and money on your utility bills has never been so easy. Whirlpool brand's 19 cu. 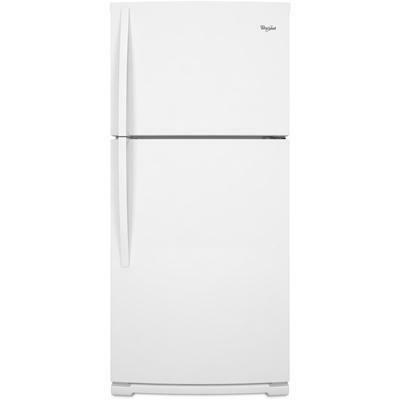 ft. top-freezer refrigerator is the industry's most energy-efficient available. It's CEE Tier 3 rated and even uses less energy each year than a 40-watt light bulb. 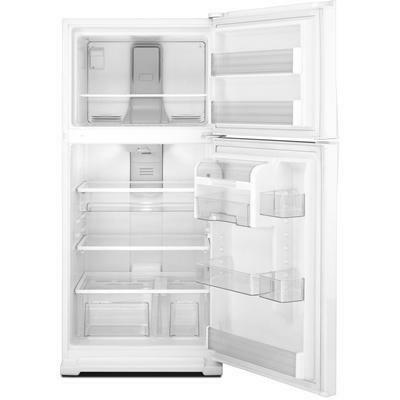 You can also store large amounts of meat and cheese with the full-widthpantry, while contoured doors, hidden hinges and a flush base grille create a modern exterior on this energy-saving model. Refrigerator 13.59 cu. ft. / 0.38 cu. m.
Technologies Store wide items or preserve large amounts of meat and cheese with the industry's largest capacity pantry drawer available. Bring a modern look to the kitchen with top freezer refrigerators that feature smooth, contoured doors, hidden hinges and a flush base grille. Select models also feature flush exterior water dispensers for a sleek look. Additional Information Can Caddy: This bin keeps beverages cold, secure and easy to grab. With room for up to 9 soda cans or a single bottle of wine, your favorite beverage is always close at hand. Easily customize door storage when and where you need it. Clear bins adjust to accommodate your storage needs. SpillMizer™ Glass Shelves: Helps you contain leaks and spills for easier cleanup while the transparent design gives the refrigerator's interior a cleaner, brighter appearance. Perfectly sized to hold a gallon container of your favorite beverage, this bin can also be adjusted up or down to accommodate taller containers. 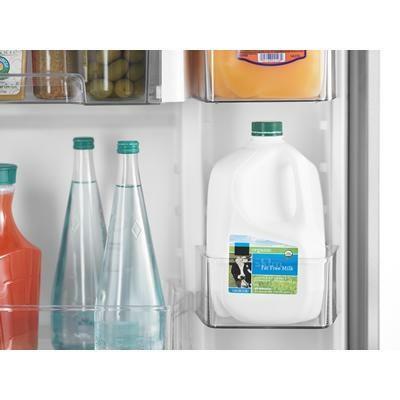 Plus, the snug fit means those heavy containers won't slide around on the shelf. Humidity-controlled Crisper Bins: Helps you preserve the freshness of fruits and vegetables with selectable humidity levels. Two crisper sizes allow for even more customization.